My son’s middle school had Open House last week, and one of his teachers told us that, every Monday, he asks the kids to tell him about something beautiful that happened over the weekend. What a gift for these kids. Especially in this hard world of hatred and sorrow. Look for something beautiful over the course of a couple of days and then share it with others to kick off a week with positivity, peace, and light. So from here on out, I’m going to post on Mondays, and I’m going to start my posts by telling you something beautiful (which, in case you missed it, I just did). I hope that it will inspire you to find and share something beautiful, too. COACHING– One of my adult ed writing courses is in full swing, and I’m gearing up for another one, which will begin next week. I love working directly with other writers. As much as I strive to help them develop stronger skills and confidence, they teach me in return. Each student always brings me a new question I’ve never encountered before, and in my search to find the answer, I grow a little bit more as a writer. So if you’ve ever taken a course, workshop, worked one-on-one with me, or even posed a question here that made me think — thank you for helping me build my skills! I will post every week (unless I don’t) inspirational and helpful blogs about storycraft. I have some ideas about how to offer more value to not only my readers, but also to anyone who is looking for personalized writing help. I’m always open to suggestions for topics, so feel free to add in the comments below. Along with your pizza. ENRICHMENT PROGRAMS – I am beginning a brand-new enrichment writing program at the local middle school in two weeks. I’m super excited to write with this age group, which I haven’t done in a long time! I have been busy developing new games, prompts, and activities to inspire tweens to write. My usual elementary school writing programs will begin again shortly—still waiting on confirmation of the schedule. GARDENING & WILDLIFE – Well, I regret to say I made little progress with my gardening this year. The butterfly garden I started a few years ago needs to be moved because my neighbor’s pine trees are casting too much shade on it. The deer ate my asters–the entire flower and half the stem. They were asters I dug up from my mom’s garden after she had passed away. I normally don’t dislike wildlife, but those deer overstepped their bounds!! In a Hurculean rescue effort (like, in the middle of a rainstorm and with a broken shovel), I dug up what was left of the chomped-up plant and moved it to the front of the house, where the deer don’t dare frolic because of my guard dog, Ginger. 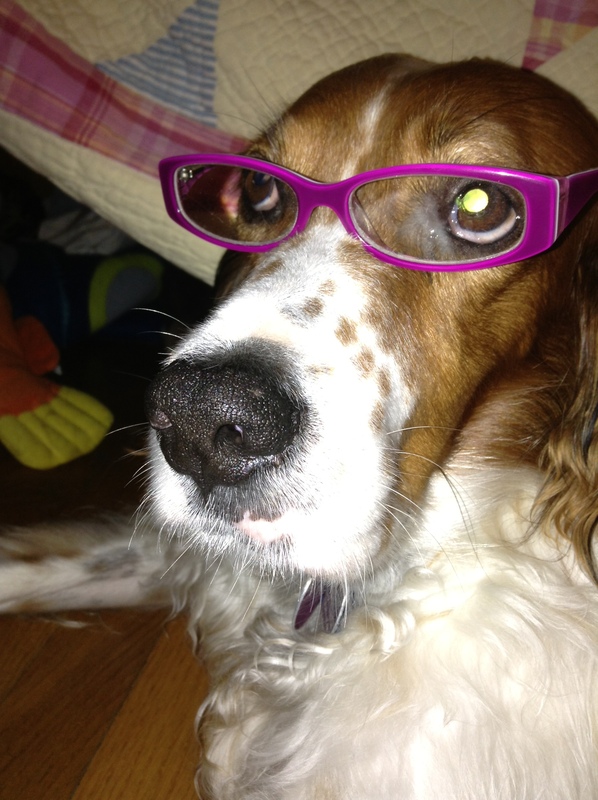 Don’t mess with a dog in glasses. They came back to life!! We just had a staring contest for awhile and then we returned to our tasks at hand. He stayed put and I continued to weed. What have you been up to lately? 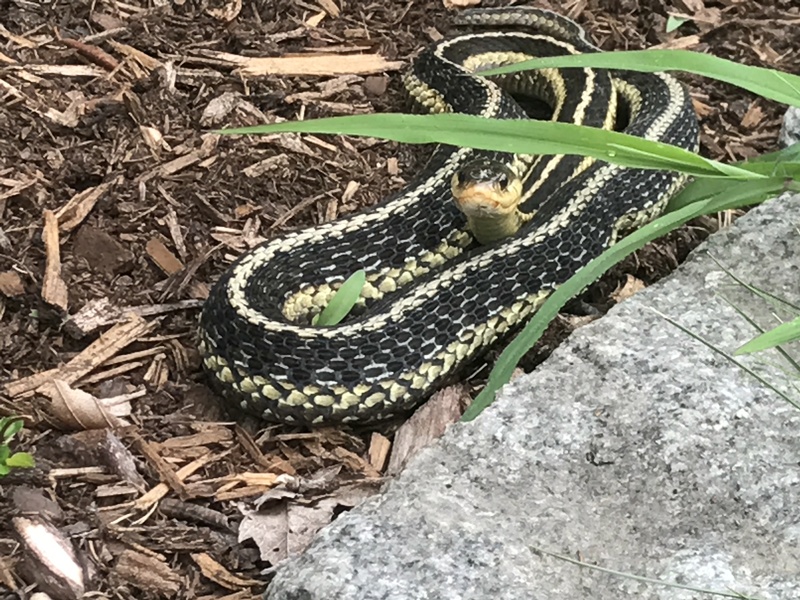 Any snakes in your garden, either literally or figuratively? I am so pleased to hear about your mother’s asters, what a lovely outcome! Ours are glorious this year, humming with the buzz of many happy bees. Your son’s teacher is so insightful, teaching them a new way of looking at life. I woke up to a text from my uncle discussing his latest painting – he is a much better artist than I am but we always send each other our latest works and he has always encouraged me to draw (and now that he is getting older, I think I am encouraging him to continue painting). That’s my beautiful story – thank you for letting me mark the memory. Hope you have a beautiful week, Andrea! I like how the teacher starts Mondays. I do something similar when I talk with some of our elderly relatives who tend to complain all the time. I ask them: what’s new and wonderful? Kind of throws them for a loop, but inevitably I eventually get them to say something good. 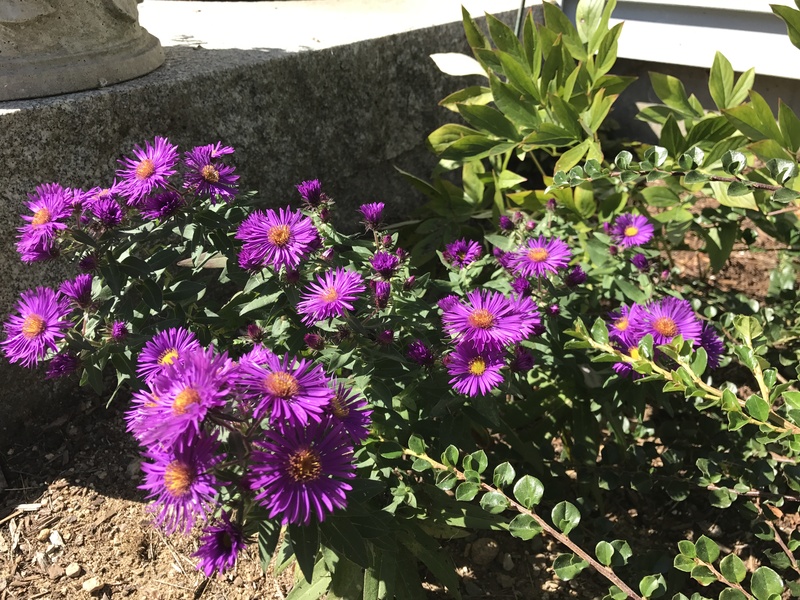 Asters are certainly a draw for all kinds of wildlife, deer, bees, flutter-bies. They’re one of my favorite flowers, and now that I know how hardy they are, I’m going to get more! Wow! What a brilliant idea! That’s the way writing prompts should be. I think you do a great job of showing us beautiful things, yourself. Thank you! The asters and your son’s teacher are beautiful! My gardening chops are a joke, so I admire other people’s gardens instead. And I frequent our local farmers’ markets. Life interuptus happened a while back, and the past several weeks has been a grand push to get my son underway in 9th grade, here at home. (He’s enrolled in an independent study program). Just today I was (still) working on putting together my son’s 9th grade curriculum. Yes, we’re a bit late, but little by little, piece by piece, it’s coming together. And the first subject he’s been working on? Writing! (One of his challenges, along with reading and math). Wish us luck! Honestly, I’m not a skilled gardener. I tend to go with native species because they’re harder to kill, haha. I wish I had a greener thumb, though, I love flowers and trees and all the wildlife they attract. I like to sit out there and just listen to the birds. Thanks, Mayumi! I’m looking forward to taking the blog on a bit of a different spin with the “beautiful” shares each week. I seem to have extra energy at this time of year, so it made sense to do a little bit more than I usually do–before the holidays hit and my blog becomes a ghost town again. I write horror, so, most of the time, even that is beautiful to me. I love to hear beautiful things, regardless of what they are. Thanks. I love that, Scott. Horror should be beautiful to those who write it and read it. Otherwise, what is the point? Kate! I’m so excited for you and how you’ve been stretching yourself and helping others! I’m encouraged by your commitment to writing. ..certain events the last couple years took a serious toll on me, but I’m starting my ascent back. what a nice thing to say–my objective with the blog is to inspire others, so you made my day. My week! Tough life events somehow kick our writing progress in the arse, and I don’t think there is any one foolproof solution. We have to want it badly enough–that’s usually the bottom line I come to when things are really stressful. Gather your gear and restart your journey. Sounds like that’s what you’re doing, and that’s awesome!